Oil Painting Lesson Step 1 : Painting Techniques| Oil Paintings :: How to Paint Realistic and more! The first step is background. Using your palette knife, coat the canvas with a fairly uniform layer of paint. Since this is a landscape you must apply color to this abstract layer, for it will eventually have to represent sky and water. So get in some healthy blues and greens, but also be creative and have fun. Don’t be afraid to include some brown, while lighter colors like yellow can also be used. Always remember, though, that the green and blue ought to be prominent. An easy-flowing wrist motion accomplishes this background. Naturally, you will be using the flat side of the knife. When you start your first painting, spend some extra time applying the basic colors. While it is never a good idea to thicken a canvas with disgusting mounds of superfluous paint, for your first time, it can’t really hurt to get the feel of the knife as much as possible. Already, in this rather uncomplicated first step, we have need of the toilet paper. As you know, no background is really flat. The sky is alive with so many shades of color that some are projecting towards us while others seem shy and hang back. Before you ever start painting you must memorize a basic principle: light creates depth and form. A sky crayoned by a child doesn’t really look like a sky. It is too uniform. Nothing is acting upon it, no sun is forcing one patch patch to appear distant and hazy, while causing other spots to look as if they’re bulging down on us. To create depth in your background use the tips of a piece of toilet paper and gently dab the surface. Small dots create what is called a pointillist effect. Already you will note how I those dots lend dynamism to the surface, as if pieces of color I are dancing in various directions. 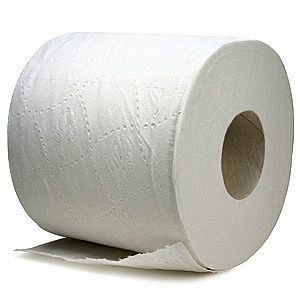 Though toilet paper is a very light material, it can still slop up a canvas if used carelessly. I therefore recommend that you learn how to hold a piece of toilet paper so that you can easily manipulate its tips. It is never really necessary to tear off more than two or three sheets at a time. To further understand what we have just done, think of the foundation of a house. It is a beginning, a mass of inchoate material. You can’t really know what it will be until you happen to see it situated on a construction lot or between two other completed houses. It is an abstraction. Abstraction always precedes realism. The windows, the lintel, the chimney will later identify it. So too with skies and rivers: They proceed out of a swirl of anonymous color. The next time you see an abstract painting by a true master like Pollack or Kandinsky, don’t dismiss it out of hand. Think of it as matter in the process of becoming a recognizable something, and remember that you yourself have followed the same procedure as part of a more conventional endeavor.